The comedian and writer committed the profits from a series of 2006 warm-up shows for his 2007 stand-up comedy tour to Macmillan Cancer Support. He has said that “about a million pounds” were raised for the charity. 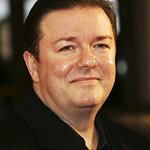 Gervais contributed his voice to a PETA video, along with Pink, against the use of animal fur and skin in fashion. Ricky is a huge supporter of anti-cruelty causes. Google trends for "Ricky Gervais"